Registration officially opens Monday, November 20 for runners and walkers from near and far to sign up for any of the five running events on the 2018 Je Cours Qc race calendar. Big news for 2018: the SSQ Quebec City Marathon is moving to the weekend of October 12–14 to wrap up the season in style. There’s no change to the traditional season-opener, though, as the Oasis Lévis Half-Marathon kicks things off on May 6. Next up is the Duchesnay Coureur des Bois Trail on May 21, followed by the Quebec City Descente Royale presented by Les Promenades Beauport on June 3 and the Quebec City Staircase Challenge on June 17. “After weeks of discussions with various tourism and sporting partners and the City Council, we’ve found the perfect weekend for the SSQ Quebec City Marathon,” said Chantal Lachance, Vice-President of Marketing and Operations for Gestev, event producer for Quebec Running Events Corporation. Registration officially opens on Monday, November 20th, 10:00 am, for runners wanting to sign up for any or all Je Cours Qc events. To register and find out more about a range of training programs designed by local elite runners, visit www.jecoursqc.com. Now’s the time to take advantage of special pricing, with early-bird registration rates valid until January 7, 2018. The ever-popular Oasis Lévis Half-Marathon kicks off the 2018 Je Cours Qc running season and is expected to attract more than 3,500 runners and walkers to the south shore of Quebec City. It’s the 15th year of this event, and the same tried-and-true course is back—a fast, mostly downhill route that’s always a hit with runners. For the fifth year running, some 1,000 runners and walkers are expected to take to the trails on May 21 for a breath of fresh air at the Duchesnay Resort. Starting November 20, trail-running enthusiasts can sign up for the full 18K run, the Oasis 8K or the 1.5K Kids Trail. The Quebec City Descente Royale presented by Les Promenades Beauport is back in 2018 for a 33rd year, challenging some 2,000 runners and walkers to give it their all down a legendary course that’s more than 95% downhill. Participants in all distances—Oasis 10K, 5K and Kids 2K—get to run or walk through the streets of the city’s Boischatel and Beauport districts on June 3. 2018 is the tenth anniversary year for the Quebec City Staircase Challenge, coming June 17 with some great changes in the works! In addition to the 19K and Oasis 13K races, the organizers are pleased to announce a new 8K distance and a 2K Kids Race—making it easier for runners and walkers of all abilities to take to the stairs. 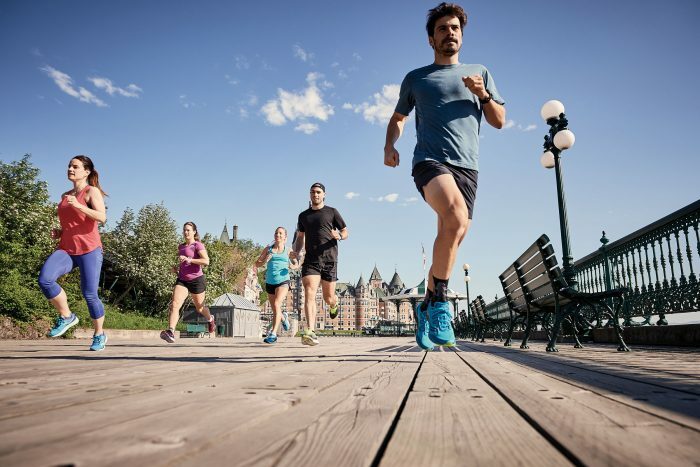 2018 will be the first year the SSQ Quebec City Marathon takes place entirely on the Quebec City side of the river, and the organizers are pulling out all the stops to make this a spectacular grand finale for the Je Cours Qc season next October. Runners who are in it for the fun can sign up for the SSQ Star Race, an after-dark fun run on the Friday evening. And that’s not all: the family-friendly SSQ Health 5K and 2K Kids Race promise plenty of fun for all ages during the daytime too. But for many, the high point of the weekend will be the Sunday as thousands of runners and walkers take to the streets of beautiful Quebec City for the 10K, 21.1K half-marathon and 42.2K marathon events!